Mostar is a small city in Bosnia and Herzegovina, a newer country that’s chock-full of recent history given the Bosnian War in the 1990’s. 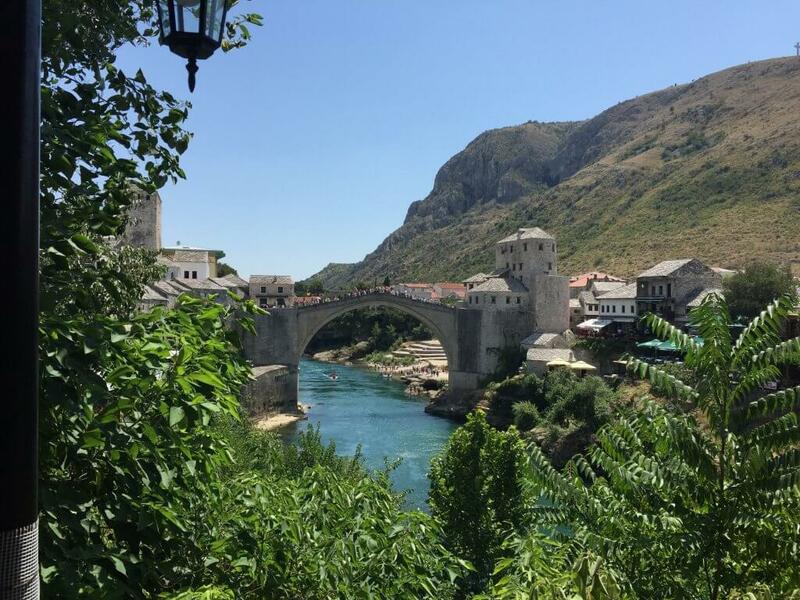 While it’s not the most popular place to visit, more and more people are traveling to Mostar. It probably helps that it’s a quick bus ride from Dubrovnik, a super popular travel destination. The bus from Dubrovnik to Mostar costs about $20 (115 HRK) and is scheduled to take about 3.5 hours. However, from our experience, expect it to take about an hour longer. If you’re visiting Croatia, Bosnia and Herzegovina, or anywhere in the area, It’s definitely worth spending at least 24 hours in Mostar. Mostar is a pretty small city, and while there are a few different places you can stay, the best hostel to stay at in Mostar is Hostel Miran. They have all the amenities you could want and different types of rooms, like dorms and private rooms. 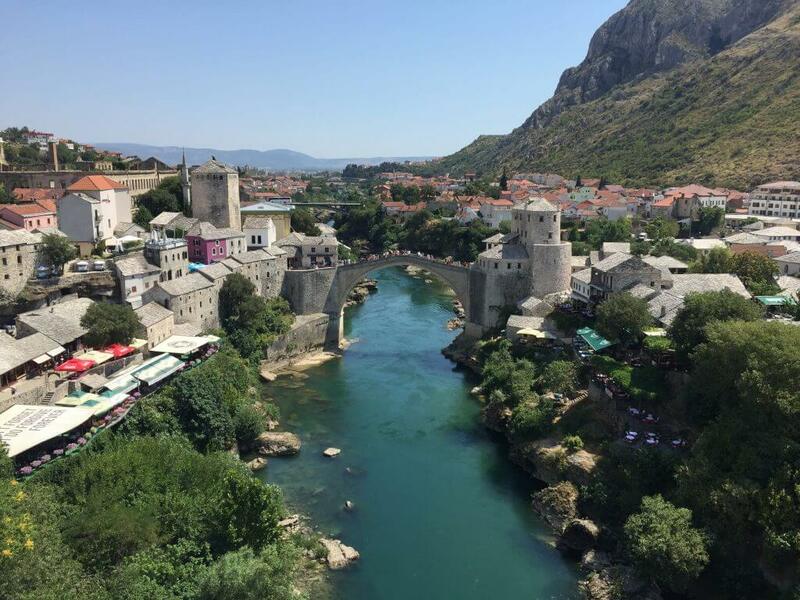 However, the thing they are best known for is their Historical Tour of Mostar where the owner walks you around Mostar and teaches you about the city’s incredible history. Unfortunately, we were not able to do this based on our bus arrival and departure times. 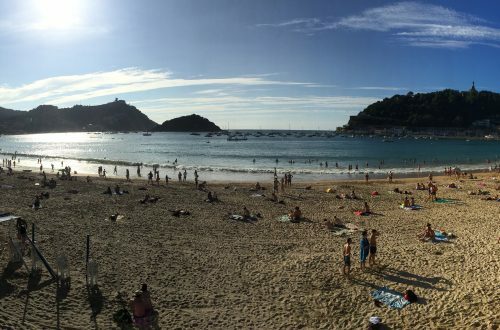 It’s highly recommended, and we want to go back to do the tour someday. Stari Most – The Stari Most bridge in Mostar is without a doubt the most famous thing there. 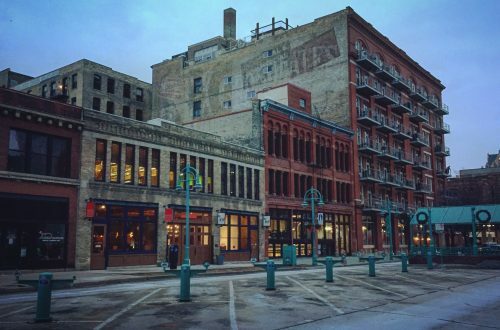 It’s iconic, beautiful, and full of history. Stari Most was built in the 16th century but was later destroyed during the Bosnian War in November of 1993. It was rebuilt to look like the original in the early 2000’s and was completed in 2004. 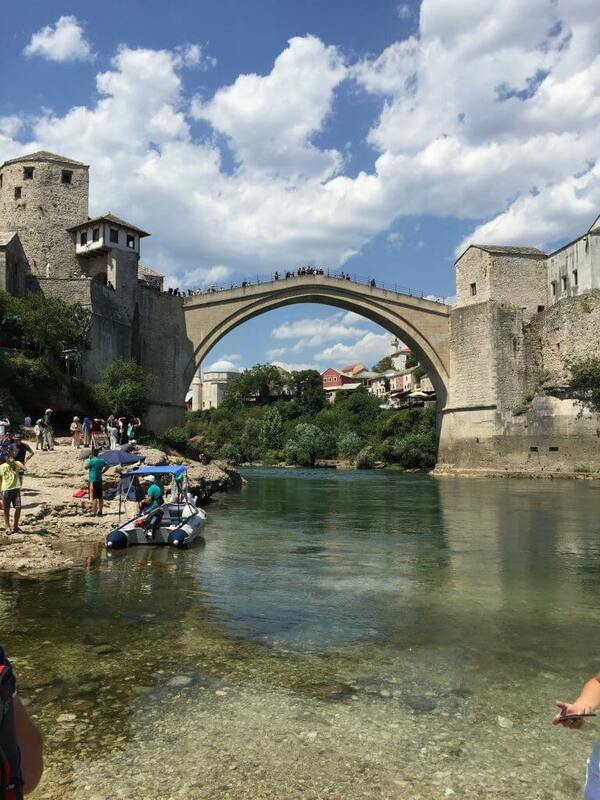 While it’s heart-breaking to think Stari Most was destroyed, it’s incredible that they rebuilt it to look like the original bridge. If you’re wanting to take pictures of it, here are The Best Places to Photograph Stari Most. Sniper Tower – The Sniper Tower in Mostar is another place to see that has a direct connection to the War in the 90’s. It is a former bank building that never got finished and was turned into a sniper tower during the war because of its unparalleled views of Mostar. 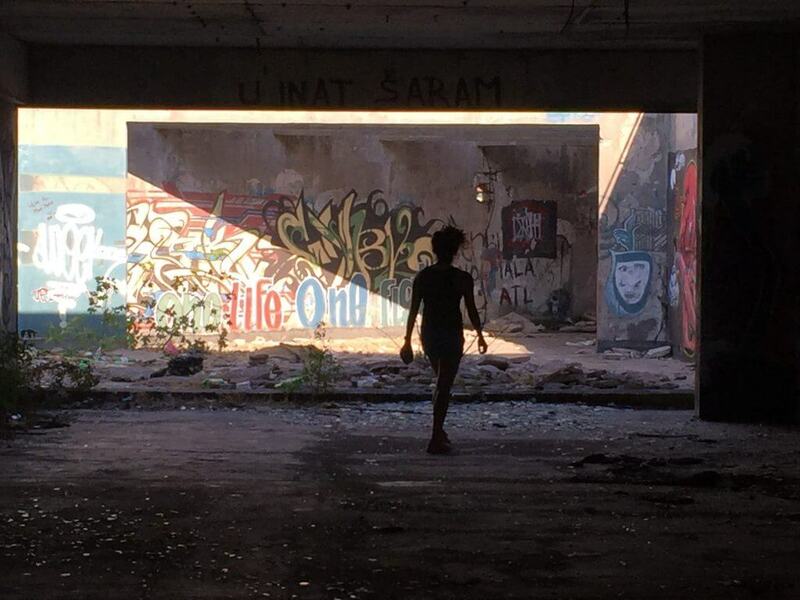 Technically, the Sniper Tower is off limits to the public because it is an abandoned building. However, lots of people climb up the tower for the views and eerie history. Around the back of the building there are a bunch of stones that thrill seekers have put up so you can climb over the brick wall blocking you from entering the tower. From there, you can climb the stairs up to the top of the Sniper Tower. Be careful though because there aren’t railings or anything to protect you from falling. The Sniper Tower really does have great views of Mostar, but it’s definitely a creepy place when you start to think that you are standing in the same spot where someone was killing people with a sniper rifle across town as part of a war. Koski Mehmed Pasa Mosque – If you’re looking for the best place to photograph Stari Most, the Koski Mehmed Pasa Mosque is it. 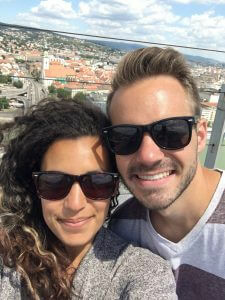 You have to pay a little to get to the top of the minaret, but the view is outstanding! If you’re claustrophobic, you probably won’t like the narrow, winding staircase up to the top, or the small space to stand in the viewing area. 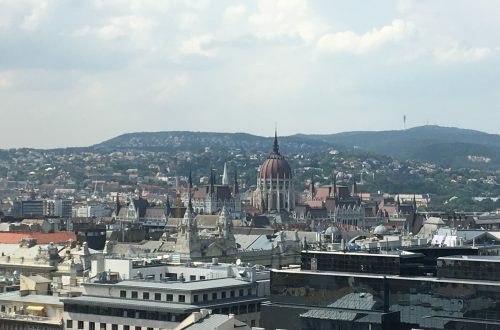 Once again though, the view is worth it! Bruce Lee Statue – This is probably the least interesting thing to see in Mostar, but it does have kind of an interesting history. 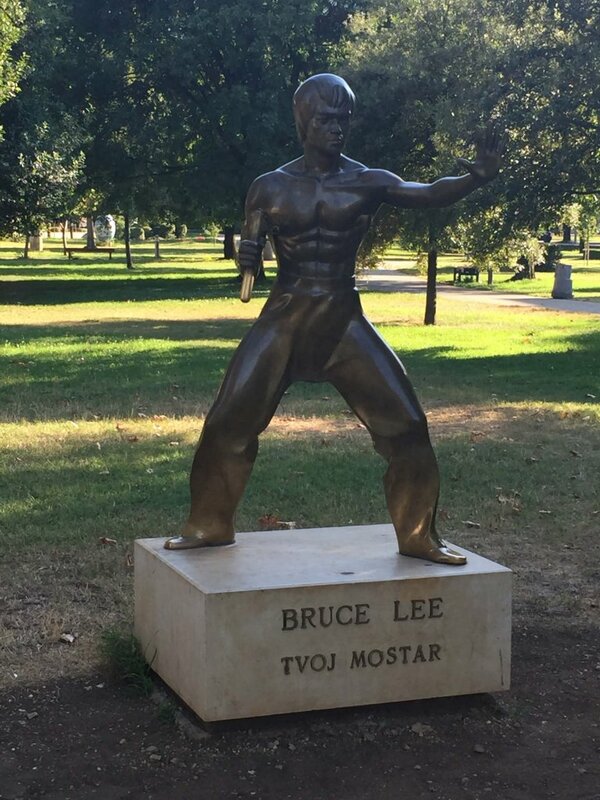 The Bruce Lee Statue in Mostar is the first ever public statue of the kung fu actor. Hong Kong actually put one up a day after Mostar did. It’s meant to symbolize the struggle against ethnic divisions, one of the causes of the Bosnian War. Cemetery – Near the Bruce Lee Statue, there is a cemetery. It’s a very sad and humbling reminder of the effects of war as the gravestones all have dates from April 1992 to December 1995. Thankfully, the war is over, and it seems as though Bosnia is moving forward. However, cemetery like these are chilling reminders of dark events that ripped apart many families and changed this region forever. 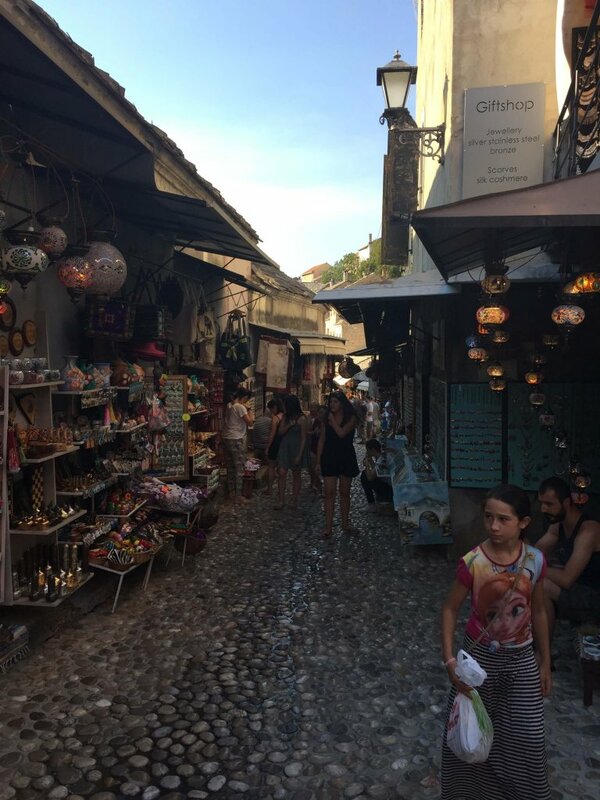 Old Town Market – Mostar’s Old Town Market, known as the Čaršija, sits right along the river near the Stari Most bridge, so chances are that you’ll end up walking right through it. If you’re looking to buy something, this market is the place to buy it in Mostar. Urban Grill – Urban Grill has an excellent view of Stari Most of their back patio. They also have delicious food that’s typical of Bosnia. Bureks – Bureks are a popular food in Bosnia, and you can get them at nearly any bakery. They are made with different ingredients, so you can try a bunch or just get the ones you like. Some of the types of bureks are spinach and feta, beef, potato, and mushroom. 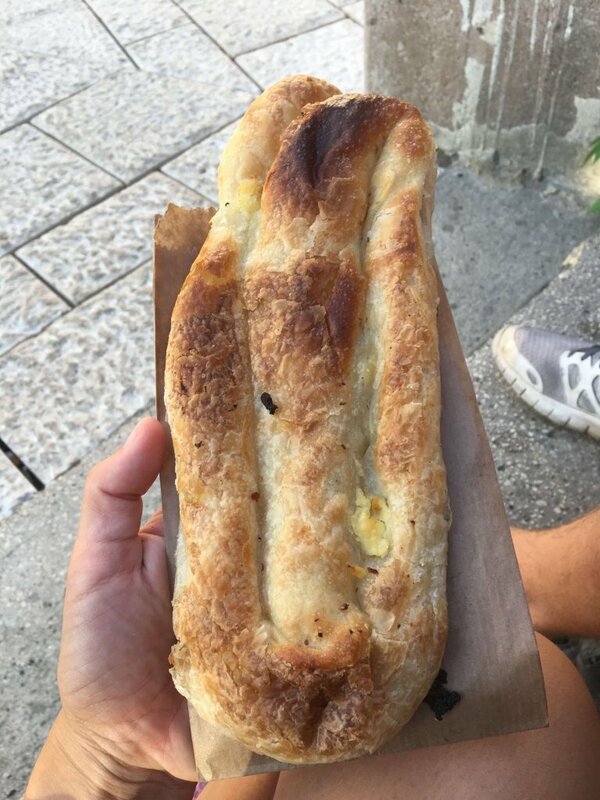 You can buy bureks at bakeries all over the city, and bureks are the best street food in Mostar. They are cheap, delicious, and filling, so make sure you try them when visiting Mostar. Mostar is one of the most beautiful cities in the world, and definitely one of the most beautiful in eastern Europe, especially when you consider it’s not by the sea. The Stari Most bridge in Mostar is also one of the most iconic bridges in the world and the highlight of Mostar. Once again, here are the best places to photograph Stari Most. Have you visited Mostar? 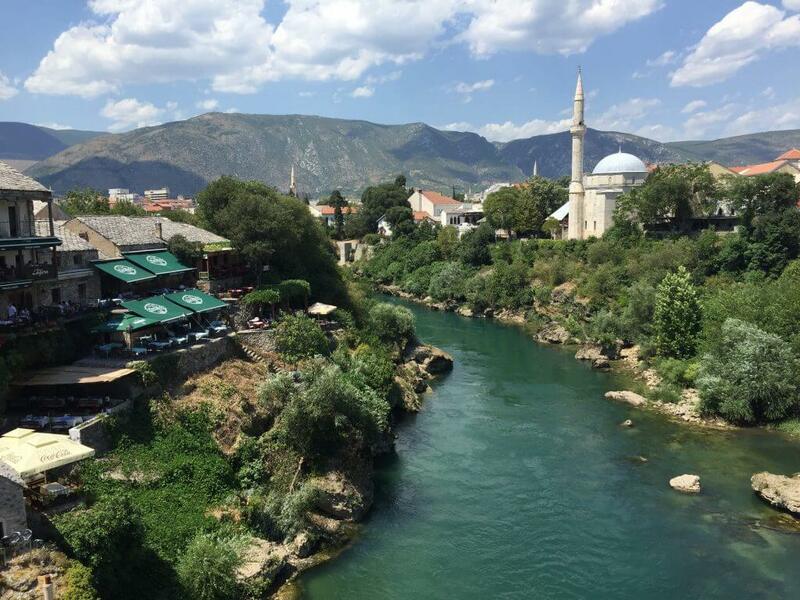 What the best things to do when spending 24 hours in Mostar?